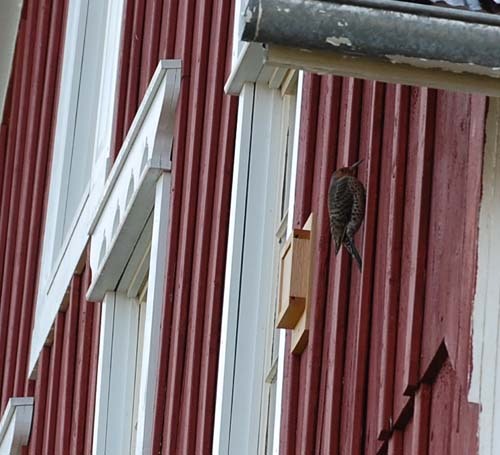 Why provide a drumming board for Northern flickers? Unlike the destructive chiseling that flickers and other woodpeckers do to excavate nest cavites or to reach wood-boring insects, drumming is simply a form of woodpecker communication. A flicker drum roll consists of a series of rapid beats, lasting about 1 second. The male often drums in spring to attract a mate and also when another male invades his territory. Drumming on a building wall or a metal roof usually does no harm, except in the case of stucco or cedar siding. Offering the cedar drumming board with resonance chamber may entice a flicker to stop using a metal gutter or flashing. It also may offer a useful tool for attracting a mate, where no better acoustic site is available. This winter, I have begun placing drumming boards at several locations where our flickers typically like to drum. Our resident male hasn't felt the need to drum since last October, when he spent a day drumming on the metal roof of our house, followed by a day drumming on the tv antenna. 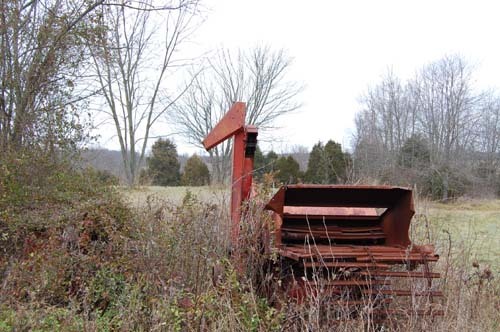 His favorite drumming location for several years has been the metal elevator of an old combine. 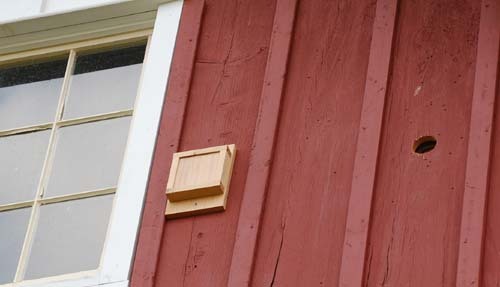 The wood siding on the barn has also been frequently used. The one attribute woodpeckers seem to desire in a drumming board is loudness. 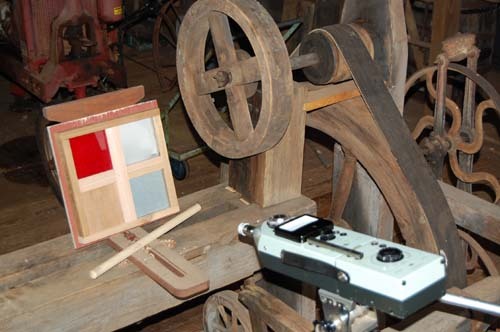 The barn wood and the metal combine elevator produce sound at quite different frequencies, but both obtain similar decibel readings when tapped with a wood dowel. I have tested a variety of materials this winter, using a sound meter with 1/3 octave filter set and have chosen a thin cedar drum mounted on a resonance chamber. The flickers have not participated in this testing, so it's only my guess that this will be their favorite drum. However, when our male feels the urge to drum this spring, a variety of drums await him, including a 4 section test drum mounted on his combine elevator. 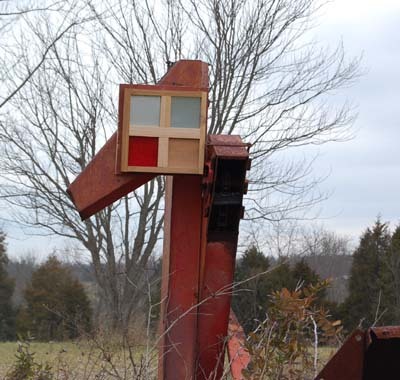 The four panels are 28 g steel, aluminum flashing, plexiglass and cedar. 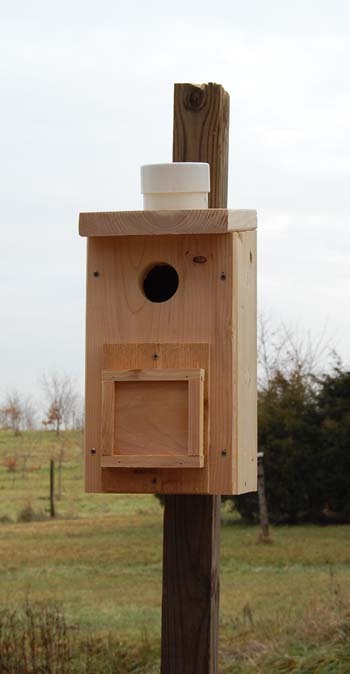 A cedar drum has also been mounted on a flicker nest box and on the barn wall. &COPY; 2010, American Artifacts and Richard Van Vleck, Taneytown, Maryland.